Autism is not something people usually read about in a novel, but Christopher John Francis Boone is autistic in the murder mystery The Curious Incident of the Dog in the Night-Time by Mark Haddon. Christopher, because of his autism, cannot fathom how human emotions work, but tries to live in a world filled with interactions with people who don’t understand him. One night, he finds his neighbor’s dog dead with a pitchfork in it, and Christopher vows to find the murderer. The hunt leads him to buried secrets about his past involving his dead mother and his father’s hatred for their neighbor. A murder mystery, Christopher’s quest leads him on a path to truth and self-discovery. The author’s first attempt at writing a novel for older readers, it was well worth the time to read. Completely creative in his characters, Haddon definitely scored a hit with this fascinating perspective of the world from an autistic teenager who hates to be touched. Christopher’s father, Mr. Boone, is like the antagonist because he ends up doing things that break Christopher’s heart. Another interesting character, Mr. Boone is portrayed as the single parent trying to raise his special-needs child the right way. However, he makes understandable mistakes, which you can relate to. The author uses these real-life characters to show different perspectives of the world, which totally capture your attention. Mark Haddon’s novel was something you just cannot put down until you turn the very last page. It’s a fast-paced plot, with twists and unexpected turns that keep you wanting to read on and on about Christopher’s journey toward realizing the truth about himself and those around him. Haddon’s insight on how autistic children think, taken from his experience working with them as a young man, truly lets you believe that Christopher could be that kid at your school whom no one understands. An exceptionally creative and captivating novel, Haddon’s work deserves to be read by all ages. The Curious Incident of the Dog in the Night-Time by Mark Haddon is the most interesting book I have ever read. Just about every part of this book seems unique, from the drawings and math problems, to the chapters, which are labeled with prime numbers starting at two. The story is told through the perspective of a 15-year-old boy with social problems named Christopher. Christopher knows the capital of every country and all of the prime numbers up to 7,057, but he has severe difficulties understanding even basic facial expressions. This novel starts out as a murder-mystery at first, but the culprit is revealed about halfway through. For a majority of the novel, it is focused on Christopher overcoming his fear of interacting with society. When he goes out on his own he has to learn to ask people for directions and deal with people touching him in crowded areas, among many other every day things we encounter. This novel is very interesting because of the way it is told. Christopher is a "special" child and tells the story like a child would. There aren’t very many uses of advanced grammar or diction, and when he does use a large word some people might misunderstand he explains it (at great length). This book reminds me of The Grapes of Wrath because of the formatting; about every other chapter has nothing to do with the story. These tangents seem to be used as filler for the exceptionally short novel, but they are usually entertaining and let you get to know Christopher better. Christopher loves math because he loves order. This is why he’s so afraid of society and emotions. Many times throughout the novel Christopher inserts math problems to "better explain" things to the reader for example: "And one way was being frightened of being far away from a place I was used to, and the other way was being frightened of being near where Father lived, and they were in inverse proportion to one another; so that the total fear remained a constant as I got further away from Father like this Fear (total). Fear (new place) x Fear (near father) = constant" (p. 136). Many times these just complicate the book, but it helps to understand the way Christopher thinks. This book is also very interesting with the way there are pictures and diagrams scattered throughout the book. I think it’s clever to put maps into the book because it’s what I’d expect Christopher to be doing in his head. I also enjoy the fact that Christopher doesn’t use too many metaphors and similes in his storytelling, he tells things exactly how they are. "And anyway, Orion is not a hunter or a coffeemaker or a dinosaur. It is just Betelgeuse and Bellatrix and Alnilam and Rigel and 17 other stars I don’t know the names of. And they are nuclear explosions billions of miles away. And that’s the truth." (p. 126). The only thing I don’t like about this novel is the mental disability of the child. Although this gives Christopher his unique personality, sometimes it makes him act brainless which gets annoying and predictable. Whenever something would go wrong, all I had to do was think of the worst possible outcome, and it would happen. This book is sensible most of the time, but when these outrageous events happen, like jumping into the train tracks, the book loses some of its realism. Overall, this is an exceptional book, which is always entertaining and unique. 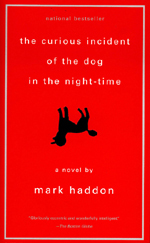 Mark Haddon did an amazing job writing The Curious Incident of the Dog in the Night-Time.